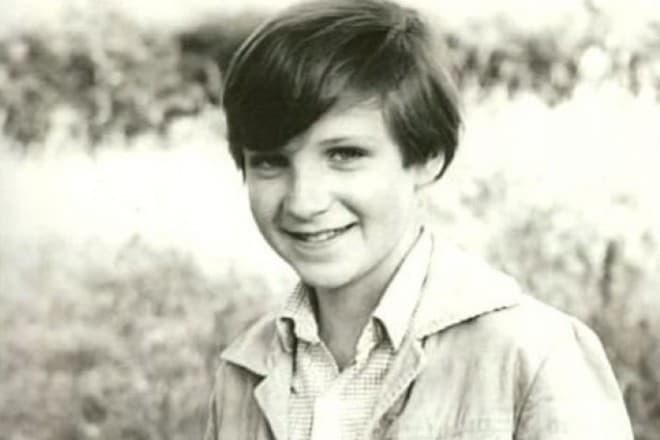 Ralph Fiennes is a British actor, producer and director. He became famous for his role in the film Schindler's List. Ralph Fiennes was born in the English city of Ipswich, in Suffolk County. The future actor was the eldest child in the family of writer Jennifer Lash and photographer Mark Fiennes. Ralph’s father came of an impoverished aristocratic family, he unsuccessfully tried his hand in farming and construction before becoming a photographer. Besides Ralph, Mark and Jennifer had five children, son Joseph, who also became a famous actor, Magnus, a composer, and Jacob, an animal rights and the preservation of the environment campaigner, as well as daughters Sophie and Martha who became successful filmmakers. In addition, the parents brought up a boy, Michael, who was adopted at the age of 11. Other Ralph’s relatives are also talented. The cousin and traveler Ranulph Twisleton-Wykeham-Fiennes, the cousin and author William Fiennes, nephew Hiro Fiennes-Tiffin, who played the role of Tom Riddle, young Lord Voldemort, in the film Harry Potter, became famous too. When Ralph turned 11, the family moved to Ireland, where the boy began to attend school. The child was home-schooled before. After graduating, Fiennes returned to England and entered the London College of Art, where he studied fine art. But Ralph quickly found another passion. It was the theater. After a year of study, he left the college and began attending the Royal Academy of Dramatic Art. While studying, Ralph acted in classical plays. After graduating, he became a member of the National Theater Company, and two years later, the Royal Shakespeare Company. Fiennes won the Tony Theater Award for the roles in the plays Hamlet, Henry VI, Richard II, King Lear, Ivanov, Coriolanus and Love's Labour's Lost. 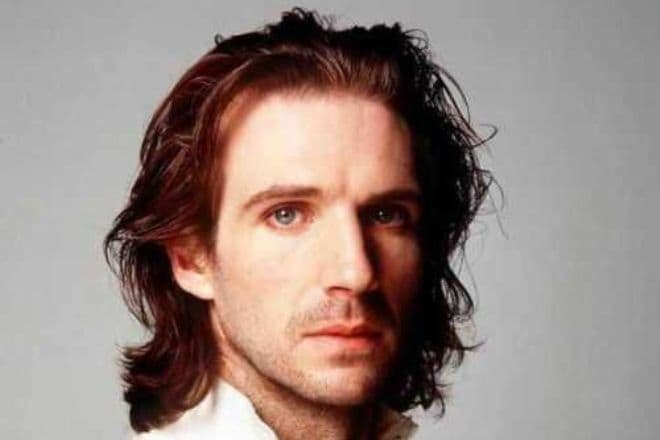 Ralph Fiennes debuted on television with the lead role in the historical drama A Dangerous Man: Lawrence After Arabia in 1990. It was immediately followed by the crime TV series Prime Suspect, where the actor played the role of Michael in one of the series. Experience of playing drama characters helped Ralph get on the big screen. In 1991, the actor starred in the role of Heathcliff in the screen version of the famous novel by Emily Bronte Wuthering Heights. Then there was the scandalous film The Baby of Mâcon, which concerned the religious theme. 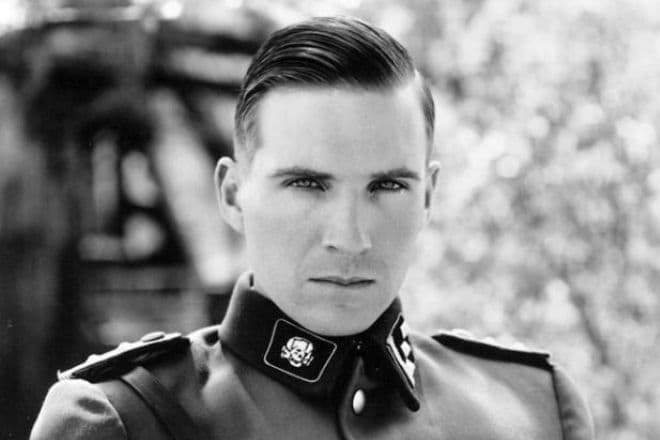 In 1993, the actor became famous around the world after the release of the historical period drama film Schindler's List, where the Briton played Amon Goeth, the commandant of a fascist concentration camp. Fiennes won the BAFTA Award for Best Actor in a Supporting Role, and was also nominated for the Oscar and Golden Globe. This film was called the best in the creative biography of the actor, and later, directors from different countries would often offer the British the roles in historical films. Then little-known films were released. The fantastic thriller Strange days can only be distinguished and the actor was nominated for the Saturn Award for the role in it. 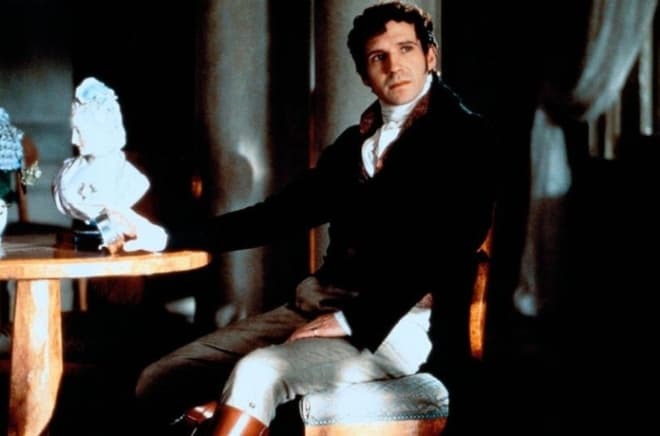 In 1996, Ralph Fiennes again excited movie lovers, made them talk about him, playing the role of László de Almássy in the screen version of Michael Ondaatje’s novel The English Patient. The actor was nominated for the Oscar, and the movie itself won this prestigious award. After this success, the actor could choose scripts by himself. Thus, almost all films with his participation became successful. There were the melodrama Oscar and Lucinda, the screen version of Pushkin's novel Onegin, directed by the actor’s sister Martha, the thrillers Spider and Red Dragon, the comedies Maid in Manhattan and The Chumscrubber, the action-drama The Constant Gardener and other films. 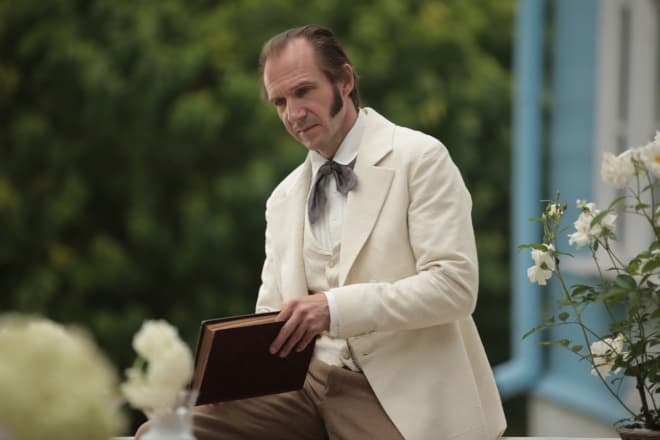 The actor has been repeatedly nominated for various film awards in Britain, Europe and the United States for his participation in these films, but Fiennes won only the European Film Award for the lead role in the historical drama Sunshine. 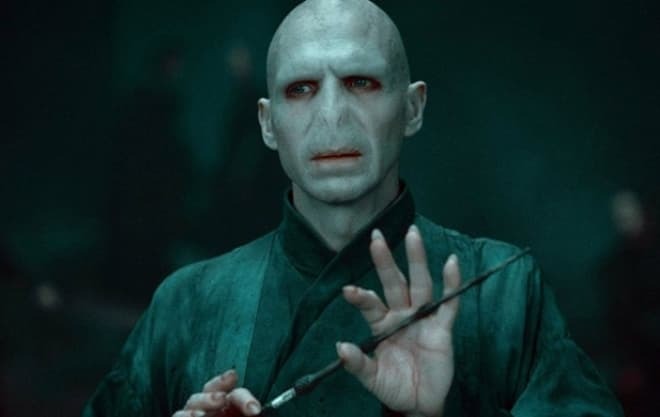 In 2005, Ralph Fiennes agreed to play the main villain Lord Voldemort in the movie Harry Potter and the Goblet of Fire, later he would participate in the sequel of this teenage movie Harry Potter and the Order of the Phoenix and two parts of Harry Potter and the Deathly Hallows. This role brought the actor the MTV Movie Award for Best Villain. In addition to this fantasy franchise, the actor starred in the historical dramas The Duchess and The Reader, the screen version of the classic novel by Charles Dickens Great Expectations, the comedies Nanny McPhee and the Big Bang and The Grand Budapest Hotel. TV viewers especially liked Fiennes’s acting in the films Clash of the Titans and Wrath of the Titans. He played Hades, and another popular British film actor Liam Neeson played the role of Zeus in the films. The latest significant work of Ralph Fiennes was the role of the head of the MI6 special service Gareth Mallory. The film Spectre tells about the adventures of the super-agent James Bond. In 2014, the actor visited the Evening Urgant show. The Briton talked with the host on various topics, concerning the films he participated in, and also plans for the future. In 1983, while studying at the Royal Academy of Dramatic Arts, Ralph Fiennes met a student, Alex Kingston, and they had a romantic relationship. The couple dated for 10 years, but only in 1993 the lovers officially married. But two years later, the actor started a new love affair, and the family broke up. The official divorce was completed in 1997. 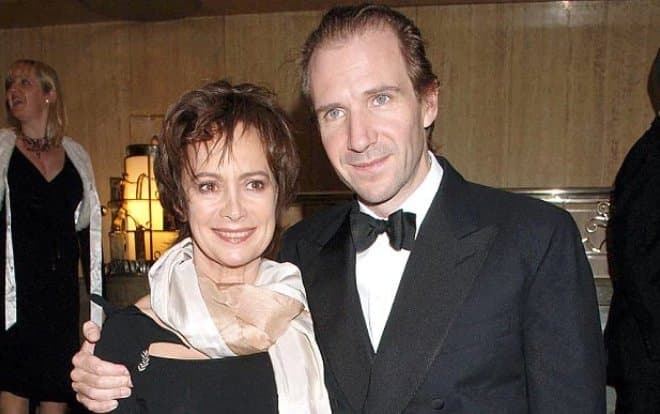 In the spring of 1995, Fiennes began to date with the theater actress, Francesca Annis, who was 17 years older than him. The couple lived in a common-law marriage for 11 years, but in the end, the family happiness was destroyed in 2006 due to Ralph’s new love affair with Romanian singer Cornelia Crisan. The new relationship lasted only for a few months. Ralph Fiennes is UNICEF Goodwill Ambassador. The actor not only continues to participate in the shooting of feature films, but also voices cartoons. In February 2017, the computer-animated comedy film The Lego Batman Movie was released, where Fiennes voiced Alfred Pennyworth. In 2016, the Briton already participated in a similar project. He voiced Raiden, the moon king and the main antagonist in the animated film Kubo and the Two Strings. The media have repeatedly reported that the actor with great joy comes to Russia, he is ready to act in the projects of Russian filmmakers, and also learns Russian and regularly visits the favorite places of the great country. The Briton got aquatinted with the Russian world while filming in the movie Two Women. 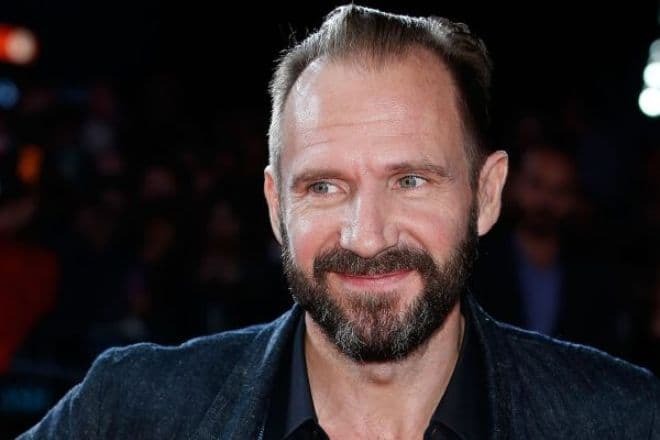 In December 2016, Ralph Fiennes confessed his love to the Russian comedy Gorko!, which was released in 2013. "When I told my Russian friends about it, they screw up faces. I was surprised and laughed, because I know for certain that there can be a French, Irish and English version of Gorko!, – The actor said in an interview. In 2017 the Briton will shoot a film about the famous Soviet dancer Rudolf Nureyev. The script is based on the book Nureyev: The Life by British journalist and former ballerina Julie Kavanagh. It is planned that the Russian actress Chulpan Khamatova will take part in the shooting of the movie, and the main role will be played by Oleg Ivenko, who is one of the leading artists of the Tatar State Academic Opera and Ballet Theater named after Musa Jalil. The filmmakers plan to shoot part of the movie in St. Petersburg. The British director told about it to journalists when he visited Lenfilm. It is expected that the film will show the events from Rudolf Nureyev’s youth, student life in Leningrad, as well as the weeks he spent in Paris in 1961. "I think that Nureyev was one of those people who, overcame borders and cultural differences, expressed through art his desire to unite people," Fiennes said, commenting on the new film. Users of Instagram and other social networks continue to follow the news about the life of the British actor, waiting for their idol’s new video, where he will show a high level of acting skills.